Can Trash Become Artistic Treasure? The saying, “One person’s trash is another person’s treasure,” seems as old as time. It is often said at garage sales and donation centers. For instance, a man might shout this when he finds the perfect 9 iron for 25 cents. Or, a woman when she finds a beautiful piece of artwork for pennies. Now, this statement is being proclaimed in art galleries around the world, and the trash being referenced is worth a whole lot more than a quarter. From New York to Argentina and all the way to Rome, artists are proving trash is worth its weight in gold… and then some. It wouldn’t be surprising if entrepreneur Justin Gignac could sell ice to Eskimos. After all, he has made a business out of selling trash to people all over the world. His company was not intentional but the by-product of a bet. In 2001 Gignac was an advocate for the concept of product packaging. He believed nicely packaged products would sell, even if the products were… well… trash. He started creating NYC Garbage Cubes to prove this point. Gignac fills clear cubes with trash found on the streets and sells them for $50 per pop. He has sold over 1,400 of them. 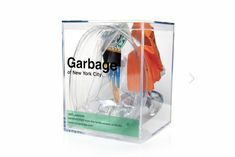 These NYC Garbage Cubes are believed to have made their ways into the homes of people in over 30 countries. In Italy, one cleaning woman might find herself wishing trash would resurrect itself. An art exhibit in Bari included cookie crumbs scattered on the floor. It is easy to guess what happened to this display. She accidentally threw away an estimated $13,700 worth of artwork because she thought it was trash. What one person sees as trash, another person considers treasure. Contemporary artwork is not always understood in its own time. Currently, the rising popularity of using trash as an art medium is anything but ordinary. In fact, it’s quite extraordinary. Who would have thought to collect and sell trash? Or use cookie crumbs in an art gallery exhibit? Perhaps Elisa Insua says it best with her term for the mixed art medium she loves. It is resurrected trash. In its new form, it is art. Have you tried doing this yet? This is one of those “Why Didn’t I Think of That?” sort of deals. LOVE this. I sort of sell trash, inasfar as my art if made, largely, from recycled and upcycled garbage. Hope your week is going well. I’m in the wrong business!